Mr. JOSEPH RAYBOULD, best known connexionally perhaps in association with Central Church, Derby, was born at Bilston, Staffordshire, on the 11th of August, 1849, where his parents were for many years regular and consistent worshippers in our Church. He was early sent to the Sunday-school, and by the help and instruction there afforded, together with that gathered from the more public means of grace, he laid the foundation of that sturdy, manly, Christian character he built up through the after years, and which won for him the affectionate esteem of all who were brought into contact and fellowship with him. At the age of sixteen he was led to definitely consecrate himself to his Saviour, and to identify himself with his people by joining the Primitive Methodist Church of his native town. He was soon engaged in Christian work, teaching in the Sabbath school. Young fellows of the make of Joseph Raybould will quickly find some sphere of useful service, or make one. Very soon he was called upon to take the assistant Secretaryship of the school, and from this position he rapidly passed first to the Secretaryship and thence to the Superintendency, a position for which by his generosity, punctuality, powers of leadership and organisation, associated with a deep love for children, he was eminently fitted. After some fourteen or fifteen years busily and successfully spent in this sphere of service he removed to London, where for four years he superintended our Peckham Sunday School. Then in August 1890 he came to Derby, and without loss of time gave himself unreservedly to the fellowship and service of our Central Church. At the end of the year, a vacancy occurring in the school Superintendency, he was elected to the post, and worthily held the position until called to the higher service of Heaven. The mere recital of the names of the various organisations to which Mr. Raybould gave his name and strength will give some indication of the strenuous life he lived, afford some indication of the gap his removal has made, not only in the Church of which he was a member, but in the religious and philanthropic life of the town and district, and in some measure account for the undying memorial of respect and esteem he has left behind him. In addition to the Superintendency of the Sunday School, he sustained the office of local preacher with credit to himself and advantage to those to whom he ministered. He was Circuit Sunday School Secretary, Vice-President of the Young Peoples’ Society of Christian Endeavour, Circuit Steward, and most fittingly, because of his buoyant, youthful spirit, President of the Sunday School Cricket Club. In addition to these offices associated with Derby Third Circuit, he was Co-Secretary of the Derby Free Church Council, Ex-President of the local Sunday School Union, President of the Derby Free Church Local Preachers’ Association, and Treasurer of the Nonconformist Choir Union. Our brother has always been known as an earnest temperance reformer, and only the night before his call to rest came to him, he addressed a temperance meeting in the Market Place, and on the following Thursday he was to have been one of the deputation appointed to interview the local magistrates with reference to the abolition of music and dancing licences in connection with the public houses of the Borough, and had he been spared none would have rejoiced more heartily than he in the success which crowned the movement. On Sunday, August 11th, 1901 – his 52nd birthday – after a full day spent in the service of God in church and school, he came to the evening service apparently in his usual good health, and whilst heartily engaged in singing the praises of the great “Giver of All,” that clear call which brooks no disobedience came to him, and he passed away from us to continue his song of praise in Heaven. Mr. Raybould was singularly happy in his home and family life, and of the greatness of the loss sustained by his sorrowing widow and family we will not trust ourselves to speak. Next to the home and family circle he will be missed from the fellowship of the Central Church, Derby, the interests of which he served amid difficulty and struggle, with marked self-sacrifice and energy. Many have been the tributes paid to his steadfast and loyal service to the church and to his sterling manly Christian character. How often one has been impressed with his uniformly thoughtful, and unobtrusive kindness, and his ready willingness to put himself to inconvenience to serve others. The funeral services, both in the church and at the grave, were very largely attended and were conducted by Rev. G.T. 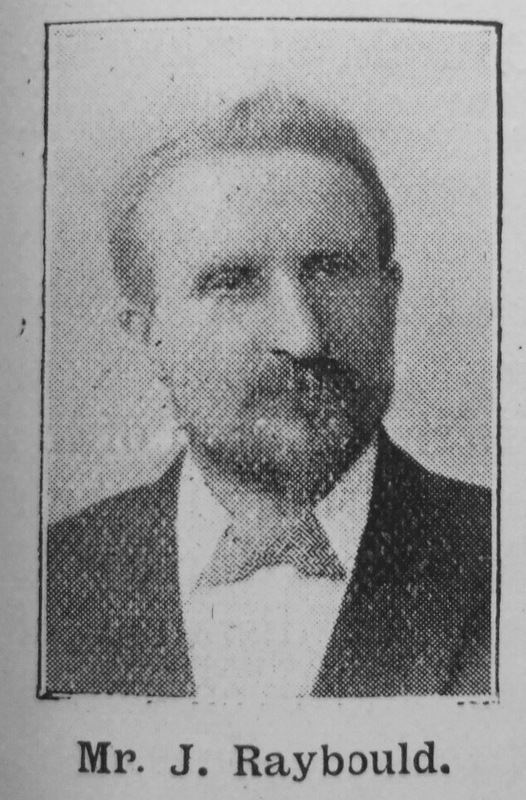 Fawcett, assisted by Revs. J. Wenn, W. Evans (who gave the address), G.G. Martindale, and A. Ward, representing the Nottingham District Committee, and Revs. W. Unsworth and G.Pagett, representing the Derby Free Church Council. Joseph was born to parents James, a stone sawer (1861), and Eliza. Joseph married Jane Wallett (1848-1935) in late 1870 at Bilston, Staffordshire. Census returns identify ten of eleven children. Note: Some early records spell the surname Rabold or Rabould.